ME: Who was Jack the Ripper? In the meantime, as promised, I did stop in over at Grit City Publications where I revealed on the Gritty Blog why I love to write about the worst kind of men, men seemingly beyond redemption. Grit City Publications publishes an entirely new medium of fiction, Emotobooks, “the first fiction medium exclusive to tablets and smartphones.” If you haven’t experienced the Emotobooks Revolution, what are you waiting for? Make it happen! Still to come, the “true” story of Mary Jane Kelly, as she might have told it herself had she still had lips to speak. 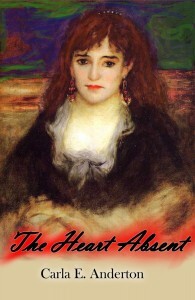 Carla E. Anderton is the author of "The Heart Absent," a tale of Jack the Ripper in love she calls "My Fair Lady" gone horribly wrong.